The buzz is back, and G2E is all the better for it. We look at the industry’s finest suppliers and products from G2E 2018. At this year’s G2E, IGT showcased a wide variety of innovative gaming, digital, and systems solutions to demonstrate why it is “Your Best Bet”. Upon entering IGT’s massive 25,000 square-foot booth, attendees were greeted by three impressively large 35-foot screens that rotated content depicting IGT’s G2E portfolio highlights such as three new The Price is Right-themed Slots. The company incorporated exciting components from the popular game show within three new engaging games:The Showcase Showdown on the MegaTower Universal cabinet, The Price is Right Video Slots on the CrystalCurve ULTRA cabinet and The Price is Right Plinko Slots on the CrystalDual+ Stepper cabinet. A major focal point within IGT’s booth was the company’s sports betting solution, PlayShot. Attendees received comprehensive demonstrations of the versatile, market-ready solution which has emerged as the leading platform for casino and lottery operators within the developing US sports betting market. Continuing its legacy as the leader in sports betting and gaming innovation, the company debuted its CrystalBetting terminal, which combines the familiarity of a slot machine with the functionality of a sports betting kiosk. The new hardware gives players a comfortable way to enjoy in-play and pre-match wagers while viewing live sporting events, all within the same display. Once again putting a new spin on a classic theme, IGT demonstrated its commitment to the Wheel of Fortune game family with the new Wheel of Fortune 4D More Money Video Slots. The title combines the player-favourite Wheel of Fortune theme with the thrill of gesture recognition and mid-air haptic technologies, enabling players to physically interact with the game’s graphics. Fans of the iconic game were able to spin a larger-than-life wheel for a chance to win fun promotional prizes within the booth. Adding to the company’s growing 4D portfolio is American Gods Video Slots. The new game features characters and scenes from the edgy TV show, and its vibrant graphics look stunning on the CrystalCurve TRUE 4D gaming machine. 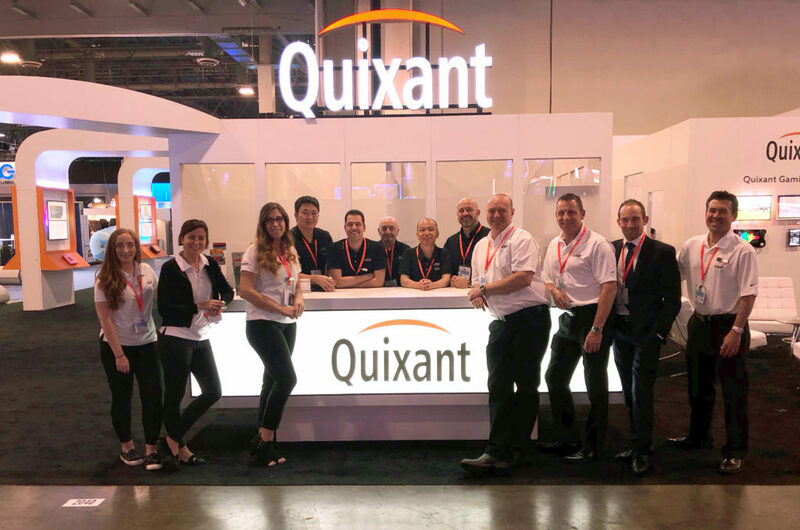 A significant factor in this interest and growth within the industry is the extraordinary speed of technological evolution; this facet was displayed in impressive fashion by Quixant, the leading global suppliers of outsourced gaming hardware solutions. However, just as much as its cutting-edge products such as the new QMax-2 and QXi-7000 platforms and 27” “floating” monitors attracted attention, it was the hidden myriad benefits behind them that were enthralling and enthusing the crowds. Quixant’s Gaming Ecosystem, a wide variety of differentiators ranging from simple game portability between different geographical markets to comprehensive on-board security features, took centre stage. A particular focus was the innovative new software tool portfolio, including QxVDR – a powerful video decoding and rendering library that enables smooth multi-layer graphics at low CPU usage levels. Alongside this, the innovative remote system monitoring provided by QxATS, QxBOOT’s significantly increased BIOS time-efficiency, and a dedicated LED management solution were all received positively. Making its international debut for Merkur, as G2E opened its doors, was what will be the first in a whole new 4K large screen cabinet range, the Allegro. Featuring a 43” curved Ultra HD monitor plus the latest Gforce Ultra HD multigame technology platform, attractive lighting concept, ergonomically assured seating position and optional video touch button panel, Allegro is sleek, curvy – and presenting Merkur Gaming entertainment in a new skin. Shown in the Allegro cabinet were the sci-fi themed Secret Area 150, Asian Tower, a game of risk and reward and the highly colourful Neon Panther. The Merkur booth (which was displaying more than 120 games in total) featured the latest creations from Merkur Gaming’s global array of game design teams, including Sunshine Games, Merkur’s Las Vegas-based dedicated games development studio with a total focus on creating exceptional and entertaining game content for the USA. As always, G2E was a presentation of the Gauselmann Group’s strength and depth in global gaming solutions with Merkur Gaming being joined by cash handling experts GeWeTe and, reflecting the current focus on the US liberalisation of sports betting, Cashpoint displayed their market leading solutions and created many new business contacts in this lucrative sector. GeWeTe – the European specialist for cash management/redemption and sports betting solutions – was in strong demand at the G2E event. GeWeTe offers an unbeatable range of solutions – for every application there is the right solution. The GeWeTe has complete control over the development and production processes, ensuring the company can act quickly to ensure that new applications are met with new solutions. The team works very closely with its customers to gain optimal market information, resulting in the best products for the market – made exactly to market requirements. GeWeTe is today a global company. This could be seen on the GeWeTe booth within the Merkur Gaming stand. GeWeTe offers local service in North and South America through the Merkur offices. That means that customers here can benefit from proven German technology with local service to match. E-gaming’s Urbain Thewissen approaches G2E with vigour and energy, as he spreads word of the company’s great products around the globe. At G2E, the company met with one of their key partners, E-gaming Mexico, to learn about Mexico’s growth in 2018 – a year with the biggest growth of installed machines for E-gaming, and with an increase in local production thanks to the great interest from the market. Urbain told Casino International that manufacturing was already fully booked until August 2019, adding: “Our product has a very high player attraction in the Mexican territory, and soon game content from our most successful games will be offered to several Mexican online casinos. The show also saw E-gaming’s Urbain meet with several key Colombian and Panamanian operators, two more countries where the company is enjoying great success. 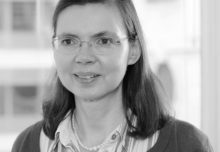 Urbain elaborated: “There are already a lot of orders confirmed, there is a forecast of installation of minimum 600 terminals for 2019 in those two countries alone.” It looks like 2019 will be a big year for E-gaming! A lot of visitors stopped at Spintec’s booth to try the new Karma GEN2 product line. For the first time in the United States, Spintec showcased its Automated Roulette and Automated Sic Bo with eight playing stations and a stand-alone playing station – and visitors were amazed by the new product line. Its sophisticated and compact design, user friendly interface and comfortable seating make for a great gaming experience that both players and operators appreciate. In addition to Karma GEN2, Spintec presented also its Aura Automated Roulette with 10 playing stations, and Aura Multigame with virtual and live options. Cummins Allison showed the new JetScan MPX 8200 at G2E, which the company says will deliver 30% greater throughput to a soft count room. This multi-pocket currency sorter is Cummins Allison’s most advanced high-volume sorter, offering customers more productivity than ever. This significantly advanced product is part of a continuing mission to offer casino properties solutions that enhance operations and offer excellent value. Innovation gives customers what they want: increased productivity that maximizes the use of soft count room personnel. With faster speeds and greater throughput, the JetScan MPX 8200 enables count rooms to be more efficient, finish drops quicker and report totals to accounting sooner. 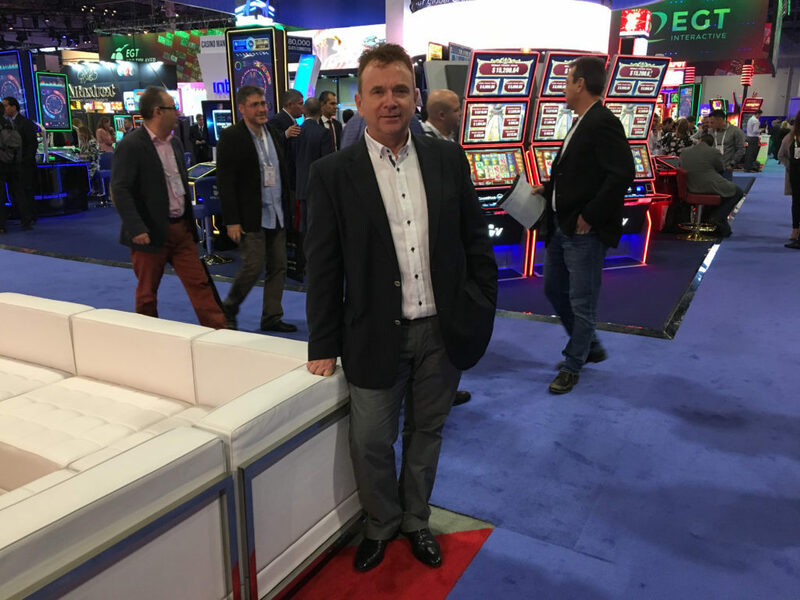 This year’s G2E Vegas was the busiest US event that Euro Games Technology, its subsidiaries – EGT Multiplayer and EGT Interactive, and its partner for the US, Reel Games Inc., have ever experienced. The show was full of meetings with customers from North America, South America (Panama, Peru, Colombia, Argentina, Paraguay, Mexico), Asia (Malaysia, the Philippines, Singapore, Sri Lanka, South Korea), Europe and Africa and ended with numerous deals, enquiries and consultations about the many paths to success the Bulgarian manufacturer has to offer to its clients. The visitors from the US appreciated the three Chinese-themed jackpot systems at the booth – the debuting Dragon’s Turn with 4 progressive levels, the already installed in the country Fu Gui Rong Hua with the new 58-580 and 88-880 bet patterns especially designed for it, and the Cai Shen Kingdom, all presented in the P-42V Stand Up Curved cabinets. The Super Premier 75 and Super Premier cabinets with their curved spacious displays and highly comfortable seats were also widely discussed at the show, as well as the next generation terminals of EGT Multiplayer – the S-Line series, and the T-Line touch roulette table with an automated wheel. Also of note is GFL Bonusing Rewards, which we first saw at G2E Asia and which is finding customers all over the world. It’s a jackpot reward system that utilises casino promotion budgets to fund mystery jackpots, creating an exciting ‘in it to win it’ prize pool independent of the base game. The GFL Bonusing Rewards system is very straightforward and appealing to players and operators alike. Funded completely by the casino’s marketing budget, the awards can be configured by a percentage contribution based on the table minimum, with players enrolled in the chance to win a prize just by participating in the hand. The only operational requirement is for the dealer to register players via a dealer console which then confirms them as taking part with the player position indicated on the display. With no additional steps, game speed and player experience are not affected. SUZOHAPP is the only global company providing a comprehensive offering of components for casino and sports betting OEMs. This includes but is not limited to LCD monitors featuring top quality brands such as Elo Touch Solutions, Wells Gardner, Ceronix, and SUZOHAPP’s very own VisionPro, in addition to touchscreens, bill validators, printers, coin mechanisms, LCD button decks, push buttons, barcode scanners, locks, toppers, USB chargers, power supply, and more. Furthermore, at G2E SUZOHAPP announced its new partnerships with Everi Payment Inc. and Digitote. The partnership with Everi should accelerate and advance cash management and automation within the gaming industry while partnering with Digitote helps SUZOHAPP develop customised sports wagering software applications that will provide a scalable, flexible hardware and software offering to the quickly emerging US sports betting industry and the larger international customer base. Product highlights for North America were in great abundance on the NOVOMATIC booth at G2E in Las Vegas, with targeted cabinets, content, progressives and systems, confirming a clear focus of accelerated growth into the market. The new slot title based on the iconic TV show of the 80s – MacGyver – created a standout impression at G2E. Presented on the towering NOVOSTAR V.I.P. 3.50 and compact V.I.P. Lounge 2.32 cabinets, NOVOMATIC’s latest IP title proved a major attraction on the show floor. Appealing to a wide audience, this retro-style game joins Angus “Mac” MacGyver on a mission to unlock safes and defuse bombs for the chance to win prizes and three progressive levels. Visitors to the NOVOMATIC booth expressed great enthusiasm for the game while taking their photo with a giant roll of duct tape, paper clips and matches. New titles driven for the US market, created by the NOVOMATIC Americas Mount Prospect studio and the Winfinity Games and 707 Games studios in Austria, were on full display and gave a clear signal that NOVOMATIC’s new, targeted content is making a mark in the North American market. Gaming Arts arrived at G2E to demonstrate its commitment to innovation and growth through a unique blend of current and evolutionary products and technology. G2E marked a defining period in the company’s history with the launch of more than ten new products and features, including dozens of new slot themes, in what was Gaming Arts’ largest G2E booth so far. 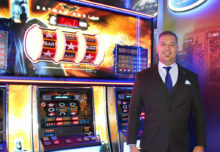 The spotlight of Gaming Arts’ diverse product portfolio was its inaugural collection of video reel slots, GA Reels. Its Class III library of content was designed with the gambler in mind through fun and approachable game content. With stunning game content and exciting play mechanics, GA Reels offers more than ten exciting new slot game titles consisting of four series: Pop’N Pays, Da Fa Ba, Dice Seeker, and Casino Wizard. The world’s first casino-wide interactive promotional game system, SuperPROMO, demonstrated an entirely new method of operating casino promotions at G2E through four fully customizable mobile games which can be awarded to targeted players for virtually any type of promotion. These mobile promotional games are delivered to players by casino personnel on a mobile tablet and promoted across a casino’s digital enterprise to deliver an new level of social interactivity across the entire casino floor. Never before has APEX Gaming had such a large amount of gaming solutions on display at G2E. Operators were introduced to innovative jackpot solutions, individual slots from the Pinnacle family, the EVO gaming platform, electronic roulette, iDROP Tito Table solutions for live gaming, live gaming tables, card shufflers and accessories. The Jackpot Islands are already a well-known brand in the USA, with the initial Dragon Egg and Leonardo’s Code games bringing real alternatives to casinos. These games have brought pleasure to many players in North America. Operators were keen to learn about the new developments and were extremely excited. The latest solution – Clover Link – was also greeted with enthusiasm. Clover Link offers a total of four different games that have the additional feature of showing how the clovers (magnets or bricks) can be activated during the game. The beauty of this series of jackpot games is that it is available in a whole series of jackpot hardware configurations. The fact that Clover Link can simply be managed both for internal casino connections as well as Wide-Area is something that has been well received by operators as well as having the flexibility of many different island and wall-mount configurations. The success story of iDROP continues and the latest additional to the family – the iDROPs – was the focus for many visitors to the stand. It can manage 250 bills (and tickets) at one time at a validation rate of up to six per second. The entire live gaming range was also on display – including live gaming tables and a series of innovations, including the Ball and Dice Tester and the Roulette Wheel Leveller with a leveling base. Dallmeier returned from a successful G2E where the company launched their new innovative Smart Casino Solutions, which were extremely well received by show visitors. Invited guests saw Dallmeier’s recently-released Casino Automation Technology (CAT) solution for BlackJack, as well as the company’s Facial Recognition, People Tracking and People Counting solutions as well as many more modules that improve business and security management in casino environments. In recent years Dallmeier has invested heavily in research and development with a vision to create innovative operational systems for real-time management of many different business areas way beyond traditional security applications. Dallmeier solutions give casino operations complete control of all areas of their properties, such as Gaming, Hotel, Retail and Strategic Marketing as well as significantly improve traditional Security and Surveillance applications. Dallmeier has a worldwide reputation from over three decades of advanced surveillance technology, the market-leading Panomera technology being the latest innovation. Dallmeier is now ready to pursue different business opportunities and strategies, aiming to place itself as a leading strategic partner for the casino operators. Developing solutions that utilise video-captured data to optimise key business processes. At G2E, Dallmeier demonstrated how casinos can use video-based technologies as true business enablers, improving overall profitability of casino operations. Casino Technology has proved once again to be heading on an upward development trajectory in Latin America with multiple commitments made during G2E Las Vegas. The strong line-up of solutions for land-based and online gaming shown by the company consisted of premium slot machines, captivating mutigames, advanced casino management systems and white label platforms as well as the next generation of online games.